But I’d be remiss not to also mention that extra ingredient which made our reading community possible: a classroom library. First, let me say that our school library is wonderful. Thanks to the efforts of our talented librarians, our school library is filled with many high-interest, engaging titles. I take my classes to the library regularly to give students the opportunity to hear book talks and to browse through the library’s collections. Still, I felt like I was hitting a wall when it came to independent reading. It’s one thing to take time to visit the library to seek books and another thing to simply be surrounded by books every time you walked into your English class. And that’s what I wanted my classroom to be—a place where students were surrounded, literally, by books. Consistently. Every day. I wanted a place where reading was “top of mind” in a way that it wasn’t before. Classroom libraries are a staple in most elementary classrooms, but they begin to disappear in middle school and are virtually non-existent in high school classrooms as “whole class novels” take over. But why shouldn’t classroom libraries continue to be available for older students? Since establishing my classroom library, I’ve seen students “hit the shelves” as soon as they walk into the classroom, looking for the next book on their “on deck” list. I’ve had to call students to their seats when class starts because they’re sometimes too busy pulling out and browsing books on the shelves. When students’ attention turns away from me during class (because my lesson is just that exciting), I see their eyes wander over to the shelves. For better or worse (I like to think for the better), students interrupt me to ask about books they see. In short, my classroom library makes a statement about the importance of reading. A classroom library sets expectations for a reading life and fosters authentic conversations about books. A classroom library creates a buzz and energy around reading (even my homeroom students are borrowing from me!). Studies have even shown that classroom libraries increase independent reading substantially. Based on what I’ve seen this past year in my students, I believe it. The entire back wall of my classroom library is filled with fiction. I purchased inexpensive shelves online that sit on my back counter. I’m lucky to have a large classroom, but I don’t have a lot of floor space. I like these shelves because they’re efficient in terms of space and height (they are just tall enough for four shelves, but not so tall that they might tip over). When the shelves begin to warp as I’m sure they will, I can turn the entire unit upside down. ABC ORDER | I organize my books alphabetically by title. This was actually the suggestion of our school librarian. Students often know the title of the book they are looking for; they do not often know the author. I contemplated organizing by genre, but I found that too many books bridged categories and defied categorization, so I simply divided my collection by fiction and non-fiction. I also used free paint stirrers from Home Depot to divide my books and make browsing a little easier. The only exception to the “alphabetical by title” are series. I keep all books in a series together with the first book in the series. So Catching Fire and Mockingjay would be under “H” next to Hunger Games, and Insurgent and Allegiant are under “D” with Divergent. COLOR CODING | Because I don’t organize books by genre or subject, with the help of some of my students, I put together a color coding system to find books of interest more easily. I used different colored stickers on the book spines to indicate genres. I had traditional categories such as fantasy, mystery/suspense, multicultural, graphic novels, etc., but I also added silver star stickers to indicate which books may have won awards (Printz, Nobel, National Book, etc. ), and gold stickers for books that were chosen as student favorites. Students looking for a fantasy book can search for spines with purple stickers. Also, this way, books that belonged to more than one category could get more than one sticker. For many years, I simply had a sign-out sheet posted that students would use to sign out books and then sign in books upon return. I included a column for “teacher initials” so that I could keep track of when books went out and came back. This system worked fine when my classroom library was smaller. Because students weren’t borrowing books from me at the rate they do so now, it wasn’t hard to manage. Once my classroom library began to grow, however, managing the paper list became untenable. I needed a new system, and that’s when I discovered Classroom Organizer from Booksource. Classroom Organizer is an online program that keeps an online inventory and allows students to electronically check out and return books. After signing up for a free account, I entered all of my books into my account. Using the Classroom Organizer app on my iPhone, I was able to scan in all my books using the UPC codes on the back each book—easy! Next, I just had to upload an Excel file with all my students’ names (a simple cut/paste from my gradebook). After that, I took five minutes of class to show students how to use the program. When students return books, they go through the “return” process online and then drop their books in the marked “Book Return” bin I have on the floor (this way, I can reshelve and have a tangible idea of what’s coming back). This hasn’t completely eliminated the possibility of books going missing/stolen. It happens. What I have found to be helpful are the bright neon stickers I attach to each book reminding them to return books once they’re finished. As far as the Classroom Booksource program itself, it can be glitchy at times—I find that sometimes students will need to refresh the website every once in a while—but it’s been a lifesaver. The iPhone app randomly freezes or quits. But all in all, with this program I have a very simple self-serve borrowing process. I can also quickly get lists of books currently checked out, as well as keep track of how many times any particular title is selected (and therefore how popular it is). There are other features, such as recording Lexile levels, genres, etc., but I don’t use any of those. My non-fiction collection is also organized by title. These books I keep on the side wall in a shelf I snagged from the library a few weeks ago when they were getting rid of them. On these shelves, I have some high interest non-fiction like Outliers, anything by David Sedaris, and recent favorites like Unbroken, Lone Survivor, American Sniper, and No Easy Day (those tend to get checked out one after the other). I use the same color coded stickers here, with the addition of a magenta sticker for memoir. What’s interesting about this color coding system is that some categories bridge the fiction/non-fiction “divide.” For example, I have several titles on my fiction shelves with stickers for “History/Historical Fiction.” I have those same stickers on several titles on my non-fiction shelves. Fiction such The Things They Carried and Between Shades of Gray have the same stickers as non-fiction titles like American Sniper and A Long Way Gone. My hope is that students who read primarily fiction or non-fiction can cross over into the other more easily by looking at related topics. I could do the same thing with science-related titles as well. Fiction and non-fiction history-related titles have the same stickers! Finally, at the end of this bookshelf, I took a cue from Nancie Atwell’s In the Middle and also keep short story collections for when a student has forgotten his/her book, as well as books on writing and other mentor texts. So how did I build this massive classroom library? Good question! Come back next week when I’ll share some tips on how to build your own classroom library, and especially on how to keep it fresh for students. In the meantime, if you have any organizational tips and tricks for your classroom library to share, please do so in the comments! Or if you have any questions for me for next week, let me know! Tricia Ebarvia currently teaches 9th grade world literature and AP English Language & Composition at Conestoga High School in Berwyn, PA. This year, she continues her quest to inspire a love for reading in her students by integrating more independent reading and free choice. She admits that her heart skips a beat whenever she sees a student with a book in his hand. She can be found on her teacher website at mrsEbarvia.com and on Twitter @triciaebarvia. This is AWESOME! 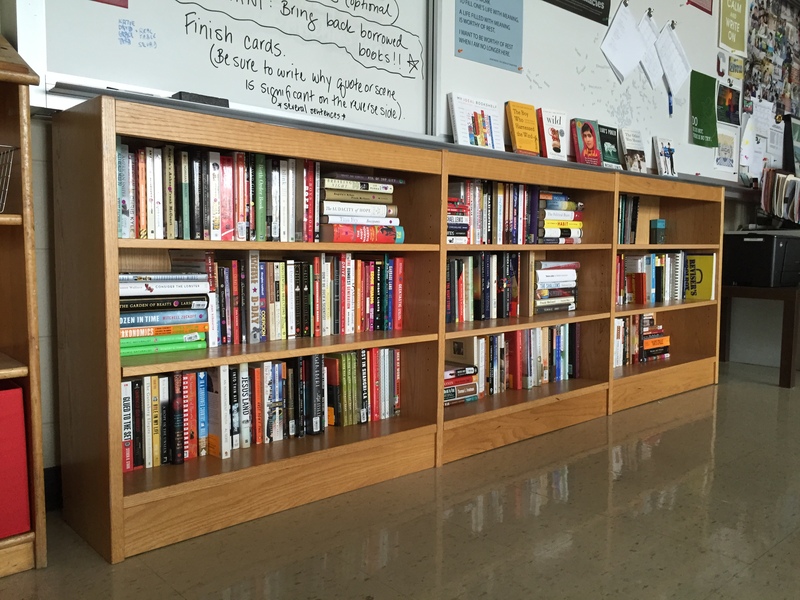 I just started really building my classroom library in August 2014, and I didn’t have a very organized check-out system at all (plus, being on a traveling cart rather than in my own classroom, I had no organizational system for my books at all). I spent my workdays last week agonizing over the best way to fix that problem for next year, since at least 50 books disappeared this year. I’ll definitely sign up for Classroom Organizer – and I’m excited to see your post on growing your library, because that’s another big (… expensive…) stumbling block for me. WOW! What an amazing classroom library. Thank you for sharing your thinking, how you organized both the library and the checkout, and the engagement of your students. Your efforts are so inspiring. I’m wondering if the App might work for the PAWLP library? Many thanks for taking the time to make your library visible in every way. What fortunate students! Tricia, thanks for sharing these great ideas you’ve implemented, as well as your thought process along the way. 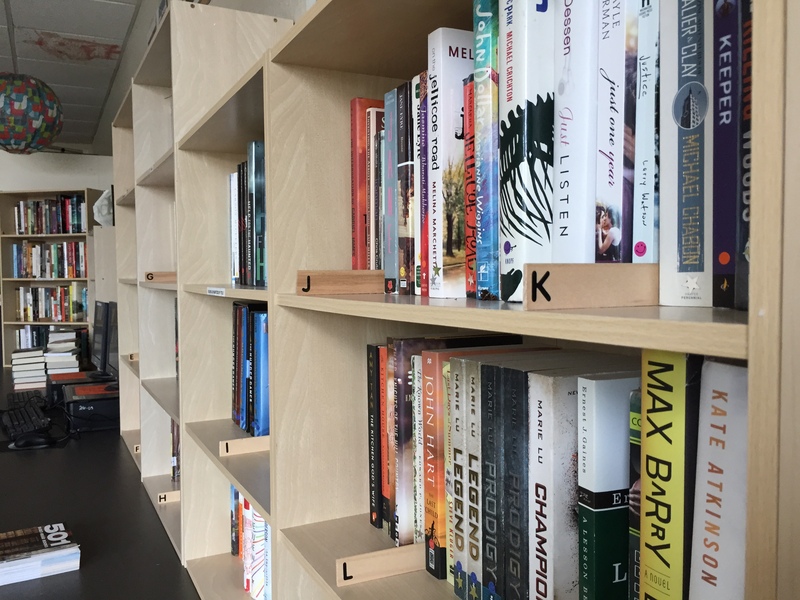 I agree that the classroom library is such a key element of the literacy environment that we co-create with our students, and you’ve demonstrated how thoughtful planning and customization to your students’ needs and interests are crucial. Great stuff, Tricia. I appreciate the organization tip. I’ve gone back and forth with how my setup looks…and you’re right, organizing by title is key. One thing I still struggle with is how many books a kid can sign out at once. I have not limited it yet, but each year I’ve always had a few kids who sign out many books–creating their own personal book piles of my classroom library at home–sometimes over the course of a few weeks. Have you ever had to manage that aspect? I’d hate to cut it off but then again it’s my fair to the kids waiting for a title which might not be read for weeks by the original student–or at all. Thanks, Brian. Yeah, I think books that “walk away” are the toughest part of this process. The Classroom Organizer app does allow you to set a limit on how many books a student can have out at once. I have it set to two books, which is fine for most students. I make an exception for some students over times like spring or winter break. But like you, I have those few who like to hoard. I just make a blanket statement at the beginning of the year that the limit is there just to make sure everyone gets a chance at some titles. That, and my obnoxious neon sticker seems to have improved things. Classroom organizer also sends you an “overdue books” email notice once a week, so that helps me nudge kids to bring back books.